Here is a score i found this weekend in a great antique store neighbourhood in the city. Yes, a whole neighbourhood of antique stores! And, besides being the style i love (retro 50s kitchen! ), it was a mere $45. In great condition. This really is my dream high chair, though i don't know if it'll be Gumball's. Originally, i wanted only chairs that could go right to the table (like the Stokke) because i prefer babe to eat with us, not behind us, but then i realized that eating times will vary anyway! 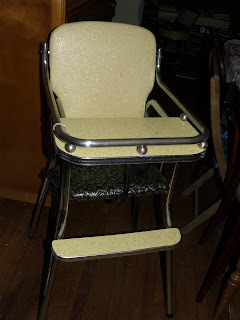 Plus, look at the great modification to make this old chair more safe - it comes with two harnesses! One is a great sturdy one, and the other is under the table tray, to stop legs from sliding through (sorry, no phot0). I imagine Gumball will be getting to try out various chairs anyway - ours, 2 grandparents' homes, and some others that we'll use at restaurants. Like, have you seen this great idea? Or is it a great idea, i don't know - but i hope to try it out! Sorry for going a bit overboard with all the (!). There are some stunning modern highchairs out there on the market...the Stokke being one of them and the 'Bloom Baby Fresco' my personal favourite. Some of the retro baby furniture is nice too, but I would be cautious about safety features, or lack thereof. Call me paranoid, but I don't think the same level of engineering for baby's comfort and safety can be found in the older pieces of baby furniture from the 1950s, 1960s, 1970s, etc. I would use that same level of caution when choosing vintage strollers, car seats and baby toys. Mind you there is a lot of toxic, Made in China crap out there too in the stores. You just need to be careful. I LOVE the baby chair! So you, and totally suits your kitchen. And I love those booties you made! I finally started to knit socks - 2 at a time - so they come out even.